The decision to move is a big step. Most moves allow you 30 days between the time you give notice and the day you move into your new space. That is plenty of time to get your life packed up. The last thing you want to do is scramble on the day of the move. Here are some amazing moving hacks that will make your next move hassle free. Of all the rooms in your home, the kitchen might be the most difficult to pack up. Between all the pots, pans, gadgets, dishes, silverware and food items you’ve got a lot going on in there. Two to three weeks before your move is when you should focus on clearing out the freezer and your pantry shelves. In other words, it’s time to eat the leftovers! When you pack up your dishes, they should be vertical instead of horizontal. Wrapping them in tissue paper might not keep them safe. Instead, consider using some of your bathroom towels or T-shirts. As for all your silverware, you could literally shrink wrap your silverware holder and put that in a box. Be careful overloading boxes with too much pots and pans. Everyone moves on the last day of the month. That means that last weekend is going to be heavily booked by movers. Even though they say they’re available you could find that they’ve double booked or are stretched too thin to get your job done. Instead, try to move at the beginning of that last week or even in the middle of the month. You may score a better deal and have a lot less stressful move. It also gives you plenty of time to clean up your old place before you need to turn over your key. You’ll be amazed at how quickly you’ll go through boxes for your next move. A good place to start is with all the containers you already own such as laundry baskets, suitcases and even trash bins. 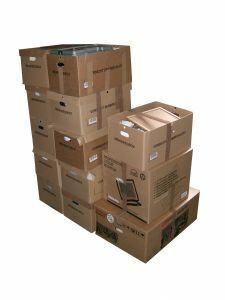 These can all be packed up a wide variety of your property, bedding and clothing. As you pack up your stuff, you’re going to discover plenty of things that you don’t need in your new place. That certainly holds true for things like old computers, clothing that doesn’t fit, furniture that’s worn out or anything else you have it used in over year. All of that stuff can be turned over to Junk King Los Angeles. Junk King will provide you with another type of moving crew but this one is taking your stuff on a one-way journey. Most of what Junk King Los Angeles collects is donated or recycled. That makes them the perfect moving partners. Don’t bring your old junk to your new place give it all to Junk King Los Angeles instead. This entry was posted in LA Junk Removal and tagged clutter, Junk King Los Angeles, next move, rubbish on June 27, 2017 by Junk King. Last updated June 27, 2017 .